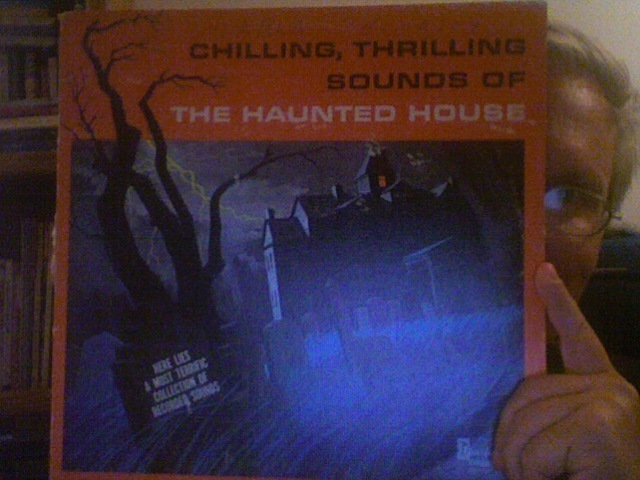 Chilling, thrilling sounds of the Haunted House! What a find! I popped into my local public library branch just before closing and saw this album cover as the centerpiece of their Halloween display–a blast from my past, and for sale at $1! The album is a collection of sound effects from Disney–stock footage of wind, howling wolves, screaming cats, insane cackling, and all other things Halloween. Side A strings them together in a series of vignettes, mostly cheesy, but a few of these filled me with genuine dread as a kid, like the sounds of creatures chewing their way through a moon lander and its crew. I didn’t like to imagine an Apollo mission coming to such an end. Side B is just the sound effects, sans narratives, to serve as atmosphere for your own Halloween party. This album was the soundtrack to many of my Halloweens–I’d ask my parents to cue it up while getting into costume. So it’s great to stumble across it now as an LP, even though I have MP3s of the tracks on my iPod already. I’ll frame it and display it proudly year-round. I’m a good enough person that I won’t play the Cat Fight track just to see how my kittens respond. I won’t. Much.